New you've found the perfect shoe! Beautiful AK Anne Klein leather lace ankle strap stiletto. Super comfortable! This shoe will be your favorite go to black shoes for any occasion. They are pre owned, in excellent like new condition and a size US size 9.5 M. The color is jet black. It is genuine smooth leather with contrasting patent leather. What more is there to say?. Get moto-inspired style from Bandolino. The Fiarrah Booties feature a Synthetic upper with a Pointed Toe. Instep zip closure. Pointed Toe. Pointed toe. Color: Black. The Man-Made outsole lends lasting traction and wear. Qupid Red Patent Leather. 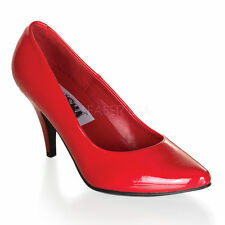 1 Qty- Qupid Red Patent Leather Pointed toe Slip on Heels- Size 6M PreOwned in very good condition. 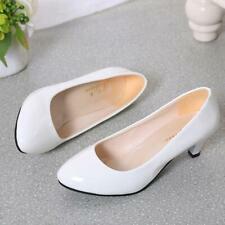 Pointed toe slip on heels size 6M preowned in good condition. These heels have a blend of Clean&Classic and high-end glamour, making these platfrom clean& luxurious and definite head-turners. Ann Taylor Round Toe Platform Pumps W Pebbled Leather Heel Sz 6. Condition is Pre-owned. Shipped with USPS Priority Mail. These are hands down the most comfortable pair of shoes in the world!! The best of the foot is lightly padded, and the very slight platform allows for extra height without tipping the scales. These are great for work or a more fancy occasion. These were worn 1x and are in great condition- I’m cleaning out my closet so all offers are welcome! Thanks! Women's Coach "Hollis" Black Satin D’Orsay Heels Size 9 with Box. Condition is Pre-owned, Worn Once & Like New. Shipping with USPS Priority Mail. These shoes are ladies size 9 US. 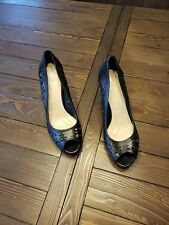 Clarks Womens Black Leather Pumps US Sz 8.5 new without box , they have been tried on in the store please see pictures. Model: HIGH HEEL PEEP TOE STILETTOS. Shoes have. 75” high platform. See pictures carefully for further reference. Upper leather is in great shape. See pictures carefully for further detail and reference. Reptile Snakeskin. Made In Italy. EXCELLENT CONDITION. See pics for imperfection. Shoes in original box. Nine West Womens Black Leather High Heel Stiletto Pumps Slingback Size 9M. My wife bought these brand new, she should have bought a 9 1/2 , these are a 9 that is the only reason they are being sold. Thanks for Looking! !